Burgers and the beach…a perfect combination. Are we having a burger war on the Outer Banks? It’s probably too early to tell if it’s all out warfare, but it does look as though the battle for the best hamburger on the beach is heating up. Always ready to put in a 110% effort for our Joe Lamb Jr., & Associates. 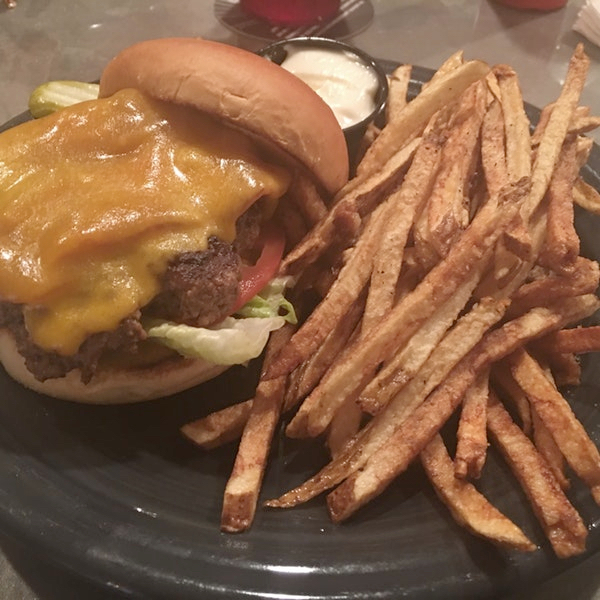 readers, we have taken on the arduous task of comparing the hamburgers of two restaurants that have opened in the past couple of years against two Outer Banks mainstays. We really like this place. Very innovative combinations on the burgers and they are big. Everything comes with hand cut fries, although sweet potato fries are an option. Personal favorites are the “Hangover”—bacon, hash browns, fried egg, and cheddar cheese with maple bacon jam—all on a bun. Be sure to have extra napkins for this one. And the Brie Me—bacon, brie, grilled onions, spinach, and sriracha mayo. Lot’s of TVs with every sport imaginable playing. Great selection of beer, small but well thought out wine list and excellent oysters. Just opening their doors this spring, Jack Brown’s is a franchise operation that, at last count, had 12 locations. Lots of craft beers to go with their burgers. The hamburgers are basic straightforward patties without a lot of frills. There are some innovative combinations, like the Elvis—The Elvis—peanut butter, mayo, Applewood smoked bacon and cheese or the Jack On Piggy Back—hamburger with griddle-cooked hot dog, pickled jalapeños & cheddar cheese. Big juicy burgers, cooked on a flattop and served with hand cut fries. A very generous portion of hand cut fries. There’s not a lot to say about Art’s Place except the burgers have rightly earned a place in the upper echelons of really good hamburger. They’re everything the doctor’s have warned us not to eat…they’re greasy, they’re salty and oh my goodness are they good. A throwback to the glory days of burgers. The dolphin boat is an outstanding substitute if red meat is not on the preferred list for the day. Not our place to say. Judge for yourself.